【Ingredients】 Each containing javanica oil 1ml, bean phospholipid 150mg. 【Properties】 This product is milk white uniform emulsion; taste slightly bitter. 【Indications】Anti-cancer medicine. 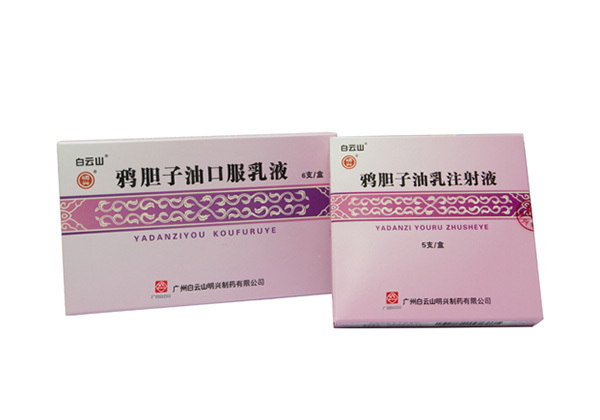 For lung cancer, lung cancer, brain metastases, gastrointestinal cancer and liver cancer adjuvant therapy agent. 【Dosage】Oral, once 20ml (a 2), 2 to 3 times a day, 30 days for a course of treatment. Adverse reactions This product has no obvious side effects, but few patients occasionally greasy feeling, nausea, anorexia and other gastrointestinal discomfort reaction. 【Precautions】 If stratification should be discontinued. 【Storage】 Store at room temperature, antifreeze. 【Packing】 Oral liquid bottle control. Each 10ml, 6 per box.